With her sleek industrial interior, Nebula radiates a modern and urban feel without coming across as pretentious. Minimalist yet cozy at the same time! While ambiance plays a key role in every restaurant, Nebula’s main mission is to deliver a personalized culinary experience to guests by transforming good ol’ comfort food into tasteful delights. 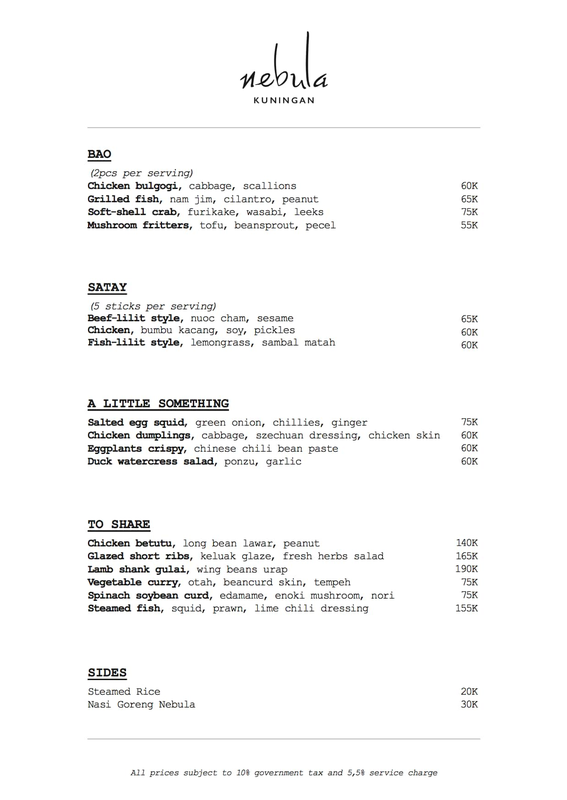 There are two different kinds of menu — Lunch Menu and Dinner Menu. Both menus offer a selection of hearty Indonesian fusion dishes and innovative cocktails. The former focuses on quick one dish options for office workers to eat during lunchtime (individual servings) whereas the latter focuses on dishes that are best enjoyed communally over long conversations (dishes for sharing). Can’t wait to tuck in! This means you need to visit Nebula at least TWICE to try out all their food. 😉 I’ve been to Nebula a few times for lunch and only once for dinner and all their dishes are amazing. Some of my favourites include their Soft-Shell Crab Bao, Thai Fried Rice Pork Belly, Nasi Campur Bali, Salted Egg Squid (a very Singaporean dish! ), Chicken Betutu (super tender and tasty), and Glazed Shirt Ribs. Soft-Shell Crab Bao (IDR 75k). With furikake, wasabi and leeks. SO GOOD. Thai Fried Rice Pork Belly (IDR 60k). Spaghetti Tuna Hang Jebat (IDR 55k). O.PL (IDR 35k). Contains orange, pineapple, and lime. Honey Bee Juice (IDR 35k). Contains ginger, lime, mint, honey and orange. For the healthy/weight conscious, fret not. Nebula has brought over their infamous smoothies bowls from Bali!!! I absolutely love their Healthy Bowl with greek yoghurt as the base (IDR 55k). Served in round wooden bowls with wooden spoons. Such pretty colours! 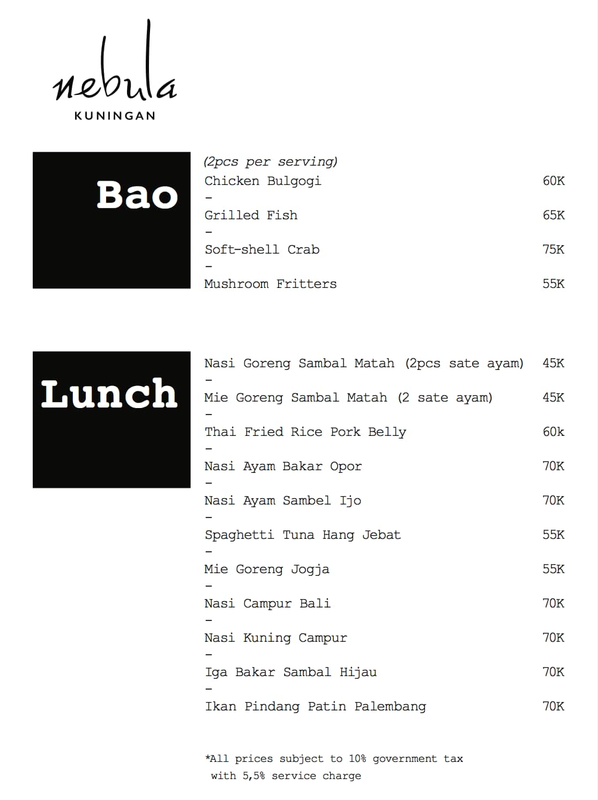 Expect to spend about IDR 150k-200k/pax for food and drinks at Nebula (lunch would be cheaper). The calories gained are worth every penny! While a regular smoothie can be slurped up with a straw, a smoothie bowl is much thicker in consistency (i.e. you’ll have to enjoy it with a spoon). One can add endless (healthy) toppings to their smoothie bowl – homemade granola, muesli, frozen fruits, raisins, nuts, acai, chia seeds…the list is endless. Smoothie bowls are perfect for breakfast/brunch/lunch, as a post-workout meal, or even for dessert. YUMMM. So where can you get your smoothie bowl fix in Jakarta?? Smoothie bowls at Berrywell (credit: @berrywelljkt). Located in the basement carpark of Fairgrounds, Berrywell is a minimalist health bar which serves up wholesome smoothie bowls of goodness. The smoothie bowls at Berrywell are very reasonably priced taking into account the fact that many of their ingredients are imported (e.g. acai berries are from Brazil). There is a grand total of EIGHT tempting smoothie bowls on their menu — from Berry Well Signature (with acai, banana, mixed berries and coco water), to PB & B (with banana, peanut butter and multigrain milk), to Choco Chia Parfait (with chocolate, chia seeds, coffee, honey and multigrain milk), to Green Energy for the super health conscious (with spinach, sunkist, banana, pineapple, and multigrain milk). Sounds ah-maaazing, doesn’t it! A healthy kind of lunch. But soOooo good! Apart from smoothie bowls which come in either small or regular size, Berrywell also offers actual smoothies, cold-pressed juices, a small selection of vegetarian-friendly burgers and wraps, guilt-free cakes, tea (from Lewis & Carroll) and coffee. I love it that the calorie count is displayed for all items on the menu. Small Amaze-Bowl with acai, mixed berries, cranberries, banana and coco water (153 cal) – IDR 45k. My Amaze-Bowl’s smoothie base is made up of acai, mixed berries, cranberries, banana and coconut water blended together. The smoothie is really smooth and thick – which means fruits > water was added in. It was topped up with generous portions of granola, banana, peach, pumpkin, chia seeds and grated coconut. Small Dragon Bowl-Z with dragon fruit, mixed berries, banana and coco water (158 cal) – IDR 40k. If you are a dragon fruit fan, you’ll love this Dragon Bowl-Z. Guarantee plus chop. Regular Berry Well Signature with acai, banana, mixed berries and coco water (306 cal) – IDR 60k. If you are spoilt for choice, you won’t go wrong with the establishment’s Berrywell Signature with acai, banana, mixed berries and coconut water as the base. And topped off with banana, kiwi, granola, chia seeds, coconut and chocolate flakes. Am lovin’ this smoothie bowl super food. Can’t wait to check out other smoothie bowl places in Jakarta! P.P.S. : Berrywell’s sister company, Leafwell, caters healthy meals to your doorstep. Their dishes are nutritionally counted and prepared daily using organic and fresh products.